The GS-TD1 gives you both 3-dimensionality and high quality recordings. It’s now possible to shoot 3D videos in either 1920x1080 Full HD resolution using the L/R Independent Format or in the Side-by-Side Format adopted by broadcasters. This allows for these videos to be burned in 3D to Blu-ray discs or to AVCHD DVDs, always viewable on 3D TVs either way. 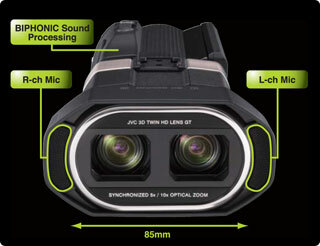 The GS-TD1 also highlights simple operation allowing you to enjoy 3D right away. In addition to videos, you can also shoot still images in 3D. These 3D pictures offer up to 2 Megapixel (1920x1080) high resolution. 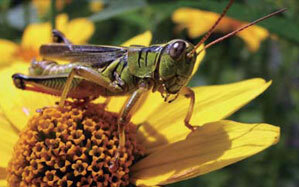 Plus you can also take 2D pictures that deliver 2.9 Megapixel (2304x1296) higher resolution. Either way, you’ll love the results. An ideal microphone structure with 85mm spacing, combined with BIPHONIC sound processing, deliver dynamic 3D sound even through a 2ch speaker system. Clearly capture the subject in 3D even from a distance. The camera automatically adjusts the parallax level while zooming so the 3D depth always looks natural and the scene looks real. The F1.2 lens is approximately two times brighter than conventional camera lenses, and is a perfect match for the Back-illuminated CMOS Sensor. You’ll be able to record in low light environments with confidence. 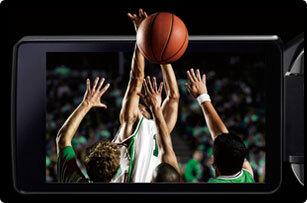 Record indoors or outside in darker situations with brilliant results. Record birthdays, weddings, sporting events and everyday life without the need for additional lighting. Wherever you point the camera, it instantaneously analyzes faces, brightness, color and distance, to automatically select the best settings for the scene. Brightness, sharpness, chroma and gamma values, and more, are all continuously optimized. Get the best possible shot, anytime! GS-TD1 offers Motor Drive Shooting just like that found on Digital SLR cameras, and it’s available in 3D! As many as 12 still images can be shot in 3D at approx. 12 frames per second (fps). Enjoy a new world of photography. For 2D stills, you can shoot up to 40 images at approx. 12fps. Just say cheese! The Smile Meter keeps an eye on how much your subjects are smiling, giving you a % display. 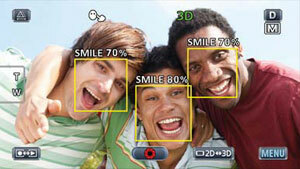 With Smile Shot, the camera automatically takes a picture (in still mode) every time the smile % reaches a certain level. Based on Face Detection technology, both these features are effective in 3D as well as 2D.